I hardly watch TV and I own very few cookbooks. I have never paid much attention to star chefs, although there are a few around that even the most ignorant person will know by name. Like Gordon Ramsay, or Jamie Oliver. With regards to the latter, it took me several years until I finally got it right whether his name was Jamie Oliver or Oliver Jamie. I never knew. This avocado salad is a Jamie Oliver creation that wasn't brought to me by him on TV or one of his books. Friends brought this salad to a potluck and I loved it immediately. I am not sure which part I like the most, but it's probably because I just like every single ingredient in it: the mustard dressing, as I belong to those people who can eat mustard straight from the jar with a big spoon. Lots of cilantro leaves that taste beautifully together with crunchy toasted almond slices. Avocados are the best anyway, that goes without saying. Now my little twist to the salad: the original recipe calls for spring onions which I didn't have. Just because it would look similar, I threw in thin slices of lemongrass. And I loved it and would not want to miss it in the salad. The lemon taste nicely complements the avocado. 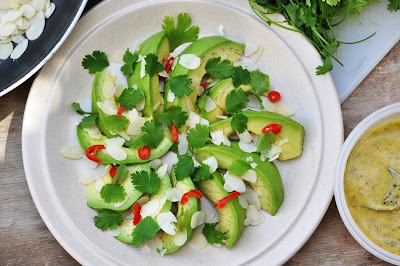 On a serving plate or in a bowl, arrange the avocado wedges. Sprinkle cilantro, toasted almonds, lemongrass slices and chili over them. In a separate bowl, combine all ingredients for the dressing. Pour over the salad as needed.